Above: Harold Wade is pictured at No. 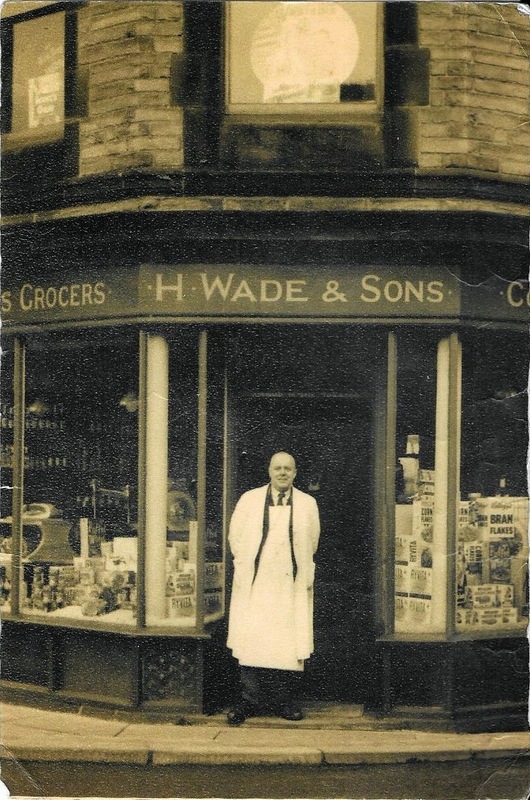 20 Briggate, a grocery which he ran with his brother Joe. The shop (which is now Paul's DIY, see below) was started by their father, Herbert, and continued for many years until the 1960s. They supplied corn and were well-known in Silsden's farming community. The photograph belongs to Harold's daughter, Betty Crabtree, herself a noted local resident, being a former chairman of the old Silsden parish council. Her late husband, Bill Crabtree, was a Briggate butcher for many years, at the premises which are now Cafe Cake. Above: following the Wade era, No. 20 Briggate had three changes of ownership before it became Paul's DIY in 1979, run by Paul Waddington. The premises were expanded in 1985. My focus on Briggate over the years can be viewed in a post earlier this month.